With such long and winding histories strung together by a revolving door of creative directors, it’s little wonder the course of a luxury brand rarely runs smooth. Fashion’s heavyweights rise and fall only to rise again as the trend barometer dictates. Not so erratic, however, are the signature pieces these labels produce; designs that become synonymous with a single name over years of constant improvement, design tweaks and fresh marketing efforts. Credit cards at the ready, here’s a primer on the iconic designer goods you should know, and perhaps one day add to your wardrobe. Gucci has undergone a renaissance recently. But as the brand moved from Tom Ford’s sleek sexiness to Alessandro Michele’s seventies-inflected romance, the loafer – the Italian label’s most iconic shoe – has remained the same. Like so many luxury brands, Gucci began life in the leather goods trade. Inspired by the link between equestrian sports and the international jet set, Mr Guccio Gucci placed a horsebit on the elite’s favoured shoe. And from there, the style became the footwear of choice for politicians, businessmen and celebrities worldwide – a success the label continues to enjoy, no matter its creative director (or whether it’s black G-strings or floral blousons it’s pushing). At a little over 20 years old, Acne Studios is still a toddler in luxury terms. But youth isn’t necessarily a disadvantage; the brand regularly turns over in excess of $200 million annually. Fittingly, it was raw denim jeans – the fashion industry’s universal symbol for youth and rebellion – that put the Swedish brand on the map. In 1997, co-founder Jonny Johansson made 100 pairs for friends and family. The simple double-stitched design of these jeans positioned them at the midpoint between luxury and Scandinavian minimalism, and they proved such a hit that the denim line grew into a wider collection of apparel. Then came two shows a year in Paris. Then came the renown. Not bad for something that started as a family freebie. One of the founding fathers of American prep, Ralph Lauren made his name with a simple exercise in subtle branding: embroidering his brand’s logo on a classic Oxford shirt. It’s proved the perfect example of logoing – bold enough to be instantly recognised, but not so brash that it comes off gaudy. No tacky slogans. No bizarre statements. Perhaps best of all though, it doesn’t distract from the rest of a man’s look, which is really what makes it a timeless and versatile menswear essential. A minor anomaly on this list, Saint Laurent’s leather jackets have only recently developed signature status. Former creative director Hedi Slimane loved a healthy decibel of rock ‘n’ roll, so much so that he decided to fuse it with high fashion. And the applause soon followed. From there, the leather jacket, be it in supple skin or strokable suede, has come to symbolise Saint Laurent’s new direction. Less Parisian Left Bank elegance, more edge. Which is just as well for fans of versatile pieces – nothing spans smart and casual quite like a quality biker. French luxury labels might traditionally be known for their agenda-setting style, but British brands know a thing or two about quality. And few of them know more than Burberry. Now over 160 years old, Burberry was the brand responsible for developing gabardine. Sounds like a Victorian painkiller, but is actually a water-resistant, breathable fabric in which the yarn is waterproofed before weaving – something that came in especially useful during WWI. Burberry created the ‘trench coat’ from the same fabric to battle conditions in the Somme. Once the war was over, the design became popular with civilians for its hardiness. The iconic check followed in 1920 and tally ho: a British staple was born. One of the most instantly recognisable watches of the last century, having appeared on the wrists of everyone from Steve McQueen to the British Royal Navy, few timepieces offer the status wearing a Rolex Submariner affords. Launched to the public in 1953, at the time the model was the first diver’s watch that was waterproof to a depth of 100 meters. Although it was designed specifically for scuba diving, it soon gained favour with anyone who liked their ticker to feature a robust design, highly legible display, superior water-resistance, and classic good looks. So that’s everyone, then? Although plagued by counterfeits worldwide, Louis Vuitton luggage has never suffered any major blows for all its imitations. Long before the famous monogram print, Vuitton developed a square trunk in 1858. By simply boxing the design and ensuring they were airtight, Vuitton reinvented the luggage game – easier to stack but still protective. Fast-forward a century, some celebrity endorsements and a beefed-up fashion line headed by cult designer Virgil Abloh, and it’s now one of the most profitable luxury brands in the world. All thanks to a suitcase. Hermès has enjoyed a long partnership with equestrian sports (what is it with rich people and horses?) What started as a bridle and harness workshop in 1837, the French firm soon expanded into other luxury goods. And while it strayed from the racetrack, it kept the equestrian focus by painting grandstand scenes on Chinese silk scarves. Today at the oldest fashion house still in operation, the design process remains the same. Over 750 hours are spent engraving the silk screens, 27 distinct colours can take six months to be transferred, and the silk itself is made from over 250 moth cocoons. Which all makes for a pretty expensive, but indisputably memorable scarf. Not quite the neophyte, but by no means an ancient, Calvin Klein is a fashion stalwart, one whose success fluctuated throughout the 1980s. But, just as the brand began to sink in 1992, its fortunes rose due to a below-the-belt invention. It was all thanks to designer John Varvatos. Calvin Klein’s then head of menswear created a new type of underwear, the ‘boxer brief’, by cutting the legs off a pair of long johns. A pre-Boogie Nights Mark Wahlberg was drafted to front the campaign and thanks to strong design (and good arms), Calvin Klein was saved from bankruptcy. “Dressing well is a form of good manners,” says Tom Ford, so it’s unsurprising that the Texan designer and film director has made immaculately tailored suits (and ergo, intensely polite men) the calling card of his eponymous brand since 2006. Cut with a polished, masculine aesthetic favoured by everyone from Jay-Z to Daniel Craig (having dressed James Bond in Spectre), there’s a reason why Tinseltown turns only to one man when it’s time to suit up. 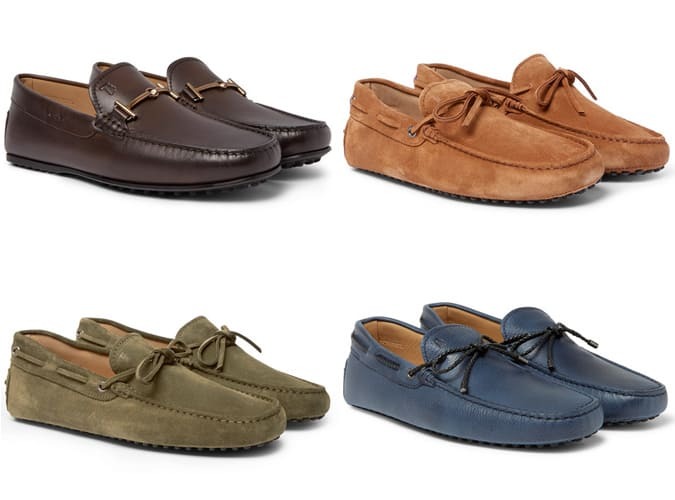 Unlike other activity-specific footwear — house slippers, for example — driving shoes are something every man should aspire to be seen in. Stylish and practical in equal parts, they’re a no-brainer for effortless summer dressing, even when you’re not planning to get behind the wheel. Made in Italy from over 100 artisanal steps, including applying each of the 133 pebbles by hand (designed to provide grip on the pedals), Tod’s Gomino model has set the lap time to beat since the 1970s. Opt for full-grain nubuck or smooth suede and take them out for a spin beneath anything from jeans to tailored trousers.